It’s a sunny Friday afternoon and it’s about time for a quick single review. 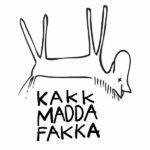 Kakkmaddafakka are from Bergen in Norway and the single “Young You” is a taster for their debut album “KMF”, due to be released on June 1st. The interesting mix of slowed-down Italo house piano, an ethereal, fragile indie vocal and a bubbling bassline evokes the era of the first dance/indie crossovers when bands like Primal Scream and The Soup Dragons first jumped on to the Ibiza remix bandwagon. This is one of the songs that’s going to sound great at festivals in the sunshine (not Glastonbury then); who knows, maybe it’s the beginning of the third summer of love. And, yes, we do get the EMF reference.